Camarasaurus was probably the most common sauropod dinosaur of the Late Jurassic Morrison Formation in North America. This large, 25-ton plant-eater was strong and massive, with powerful legs, a strong neck and tail and a rounded head. 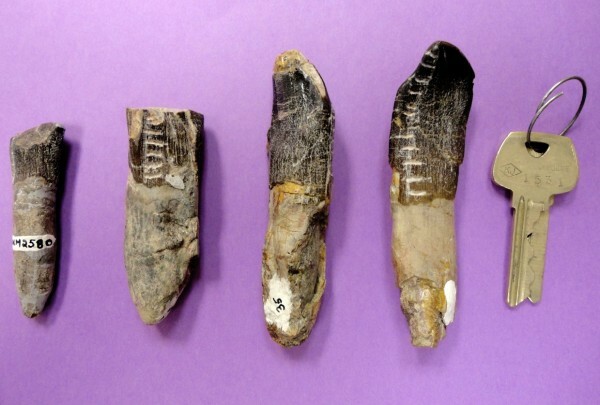 An undated photo released by Henry Fricke of Colorado College shows a sampling of dinosaur teeth from the Dinosaur National Monument in Utah. Scientists analyzing 32 teeth of plant-eating dinosaurs found that they migrated from the lowlands to highlands in search of food and water during the late Jurassic period. A new study suggests long-necked, plant-eating dinosaurs migrated hundreds of miles to find enough food for their gargantuan appetites. More than 150 million years ago, western North America was full of hungry, hungry dinosaurs. Sauropods such as Apatosaurus and Diplodocus, with their tiny heads, towering necks, hefty bodies, and long tails, ambled over the prehistoric floodplains and plucked vast quantities of food from the prehistoric salad bar. To maintain their girth, these dinos could scarf down over 450 kilograms of food per day, about twice as much as modern-day elephants. How did they keep their bellies full, especially when droughts killed off vegetation? A new study of chemical signatures in their teeth may have the answer. 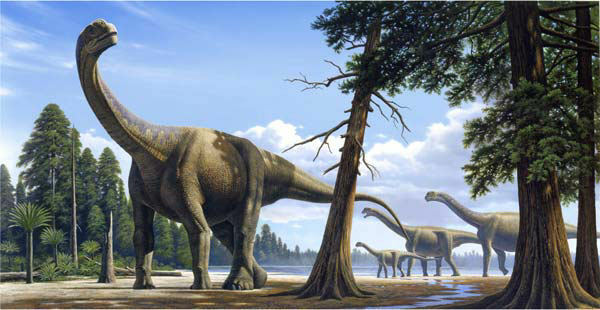 The analysis by paleontologist Henry Fricke of Colorado College and colleagues concerns a sauropod known as Camarasaurus, a 15-meter-long dinosaur with a blunt head and spoon-shaped teeth. When Camarasaurus sipped water, chemical isotopes, or atomic variants, of oxygen were sucked up into its body and became incorporated into its teeth. The ratios between these trapped oxygen isotopes can be used to detect how wet and warm the surrounding habitat was. Camarasaurus replaced its teeth throughout its lifetime, and the quick turnover of oxygen isotopes in the body meant that each shed tooth recorded where the dinosaur had been drinking in the previous month. Prehistoric soils, lakes, and wetlands also preserved oxygen isotopes. By comparing the ratios of the chemical traces in the rock record with those found in 32 Camarasaurus teeth from Utah and Wyoming, Fricke and colleagues found that the dinosaurs were drinking water from places far distant from the location where their teeth became preserved. During the wet season, the prehistoric lowl and basins of Wyoming and eastern Utah were flat, open habitats carpeted with ferns and stands of conifers. The researchers propose that the dinosaurs left this area at some point during the year, probably during the dry season, when the smorgasbord of tasty plants closed. Exactly where the dinosaurs went is unknown. In the new paper, reported online in the journal Nature, Fricke and colleagues propose a hypothetical route to higher ground in present-day southern Idaho and northwestern Utah. These places may have been refuges from the dry season where food and water were more plentiful. This is the first solid evidence that sauropods like Camarasaurus may have migrated. Although Fricke and co-authors note that not all the dinosaurs in their study migrated, most of the Camarasaurus represented by the sampled teeth did undertake the 300-kilometer journey. The same scientific technique could be used to find out which other dinosaur species migrated, where they went, and why. “As long as there are enough teeth available to have a reasonable sample size for a single time and place, this type of approach could be applied to study other dinosaurs,” Fricke says. “I think [the researchers] have a novel approach and new angle to getting at questions of sauropod migration,” paleontologist Matthew Bonnan of Western Illinois University in Macomb says. Nevertheless, he notes that all the Camarasaurus teeth were isolated specimens and were not taken from the skulls of dead dinosaurs. That means the teeth could have fallen out closer to the far-off wa ter source and were later washed by rivers or flooding to the sites where they were found. The new research the study eventually spurs, Bonnan says, will test the idea that ever-hungry sauropods traveled hundreds of kilometers for the leafy snacks they preferred.